Eunice Mary Kennedy Shriver, DSG (July 10, 1921 – August 11, 2009) was a member of the Kennedy family. She was a sister of President John F. Kennedy and senators Robert F. Kennedy and Ted Kennedy. Her husband, Sargent Shriver, was the United States Ambassador to France during the Lyndon B. Johnson presidency. Eunice Mary Kennedy was born in Brookline, Massachusetts. She was the fifth of nine children of Joseph P. Kennedy, Sr., and Rose Fitzgerald. Shriver was educated at the Convent of The Sacred Heart, Roehampton, London and at Manhattanville College in Upper Manhattan. After graduating from Stanford University with a Bachelor of Science degree in sociology in 1943, she worked for the Special War Problems Division of the U.S. State Department. She eventually moved to the U.S. Justice Department as executive secretary for a project dealing with juvenile delinquency. She served as a social worker at the Federal Industrial Institution for Women for one year before moving to Chicago in 1951 to work with the House of the Good Shepherd women's shelter and the Chicago Juvenile Court. In 1969, Shriver moved to France and pursued her interest in intellectual disability there. She started organizing small activities with Paris organizations, mostly reaching out to families of kids who had special needs to provide activities for them, laying the foundation for a robust international expansion of the Special Olympics in the late '70s and '80s. Shriver actively campaigned for her elder brother, John, during his successful 1960 U.S. presidential election. In 1968, she helped Anne McGlone Burke nationalize the Special Olympics movement and is the only woman to have her portrait appear, during her lifetime, on a U.S. coin – the 1995 commemorative Special Olympics silver dollar. Although Shriver was a Democrat, she was a vocal supporter of the pro-life movement. In 1990, Shriver wrote a letter to The New York Times denouncing the misuse of a quotation by President Kennedy used out of context by a pro-choice group. During Bill Clinton's 1992 Democratic U.S. presidential campaign, she was one of several prominent Democrats – including Governor Robert P. Casey of Pennsylvania, and Bishop Austin Vaughan of New York – who signed a letter to The New York Times protesting the Democratic Party's pro-choice plank in its platform. 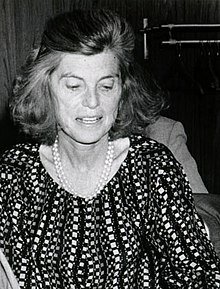 Shriver was a supporter of several pro-life organizations: Feminists for Life of America, the Susan B. Anthony List, and Democrats for Life of America. A lifelong Democrat, Shriver supported her Republican son-in-law Arnold Schwarzenegger's successful 2003 Governor of California election. 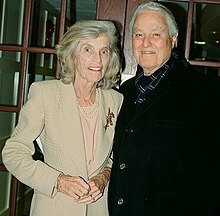 On January 28, 2008, Shriver was present at American University in Washington, D.C., when her brother, U.S. Senator Edward M. Kennedy, announced his endorsement of Barack Obama's 2008 Democratic U.S. presidential campaign. In 2008, the National Institute of Child Health and Human Development was renamed in honor of Eunice Kennedy Shriver. A longtime advocate for children's health and disability issues, Shriver was a key founder of the National Institute of Child Health and Human Development (NICHD), a part of the National Institutes of Health in 1962. She has also helped to establish numerous other university programs, government initiatives, health-care facilities, and support service networks throughout the country. In 1961, she championed the creation of the President's Panel on Mental Retardation which was significant in the movement from institutionalization to community integration in the US and throughout the world, a major public policy challenge. In 1982, Shriver founded the Eunice Kennedy Shriver National Center for Community of Caring at University of Utah, Salt Lake City. The Community is a "grades K-12, whole school, comprehensive character education program with a focus on disabilities... adopted by almost 1,200 schools nationwide and in Canada." In 1998, Shriver was inducted into the National Women's Hall of Fame. In July 2017, Shriver posthumously received the Arthur Ashe Courage Award at the 2017 ESPY Awards. With her husband, Shriver had nineteen grandchildren, the second-most of any of her siblings (her brother Robert had eleven children who have produced thirty-four grandchildren). Her daughter Maria Shriver is divorced from actor and former California Governor Arnold Schwarzenegger. As executive vice president of the Joseph P. Kennedy, Jr. Foundation in the 1950s, Shriver shifted the organization's focus from Catholic charities to research on the causes of intellectual disabilities and humane ways to treat them. This interest eventually culminated in, among other things, the Special Olympics movement. Upon the death of her sister Rosemary Kennedy on January 7, 2005, Shriver became the eldest of the four then-surviving children of Joseph and Rose Kennedy. Her sister Patricia Kennedy died on September 17, 2006, and her brother Edward M. Kennedy died on August 25, 2009, leaving former U.S. Ambassador to Ireland Jean Kennedy Smith as the only surviving sibling. Shriver, who was believed to have suffered from Addison's disease, suffered a stroke and broken hip in 2005. On November 18, 2007, she was admitted to Massachusetts General Hospital in Boston, where she spent several weeks. On August 7, 2009, she was admitted to Cape Cod Hospital in Hyannis, with an undisclosed ailment. On August 10, her relatives were called to the hospital. Early the next morning, Shriver died at the hospital; she was 88 years old. Inspired by her love of God, her devotion to her family, and her relentless belief in the dignity and worth of every human life, she worked without ceasing—searching, pushing, demanding, hoping for change. She was a living prayer, a living advocate, a living center of power. She set out to change the world and to change us, and she did that and more. She founded the movement that became Special Olympics, the largest movement for acceptance and inclusion for people with intellectual disabilities in the history of the world. Her work transformed the lives of hundreds of millions of people across the globe, and they in turn are her living legacy. President Barack Obama remarked after Shriver's death that she was "an extraordinary woman who, as much as anyone, taught our nation—and our world—that no physical or mental barrier can restrain the power of the human spirit." On August 14, 2009, an invitation-only Requiem Mass was celebrated for Shriver at St. Francis Xavier Roman Catholic Church in Hyannis. Following the Requiem Mass, she was buried at the St. Francis Xavier parish cemetery in nearby Centerville. Pope Benedict XVI sent a letter of condolence to her family. Because her brother Ted had terminal brain cancer, he was unable to attend the funeral, and their sister Jean Smith stayed with him. Ted died two weeks later, leaving Jean as the sole surviving child of Joseph and Rose Kennedy. ^ a b Staff writer (August 14, 2009). "Special Olympians, Family Celebrate Eunice Kennedy Shriver" Archived 2009-08-17 at the Wayback Machine. The Associated Press (at WJAR television's website turnto10.com). Retrieved August 16, 2000. ^ a b c Grinberg, Emanuella (n.d.). "Eunice Kennedy Shriver dies". Edition.cnn.com. Retrieved August 11, 2009. ^ "Eunice Kennedy Shriver". Special Olympics. Retrieved 2017-09-04. ^ Smith, J.Y. (August 11, 2009). "Eunice Kennedy Shriver, Founder of Special Olympics, Dies at 88" The Washington Post. Retrieved August 11, 2009. ^ Cooper, Chet. "Timothy Shriver — Special Olympics". ABILITY Magazine. Retrieved 18 February 2014. ^ Biofiles: Eunice Kennedy Shriver . Retrieved August 11, 2009. ^ Shriver, Eunice Kennedy, "Remarkable Pro-Life Women" Archived 2008-05-29 at the Wayback Machine (PDF format) The American Feminist, The Quarterly Magazine of Feminists for Life of America, Vol. 5, No. 4, Winter 1998–1999, p. 18. Accessed May 28, 2008. ^ Susan B. Anthony List, Notable Names Database. Accessed May 28, 2008. ^ Braddock, D. (2010, February). Honoring Eunice Kennedy Shriver's legacy in intellectual disability. Intellectual and Developmental Disabilities, 48(1): 63–72. ^ "About Community of Caring" Archived 2009-03-31 at the Wayback Machine. Eunice Kennedy Shriver National Center for Community of Caring. Undated. Retrieved August 14, 2009. ^ "Remarks at the Presentation Ceremony for the Presidential Medal of Freedom", Archives – Ronald Reagan Presidential Library, administered by the National Archives and Records Administration. March 26, 1984. Accessed May 28, 2008. ^ "News 21/01/08 – FISU President Receives USSA Award". Fisu.net. 2008-01-21. Retrieved 2011-05-26. ^ Armbrester, Margaret E. (1992). The Civitan Story. Birmingham, AL: Ebsco Media. p. 95. 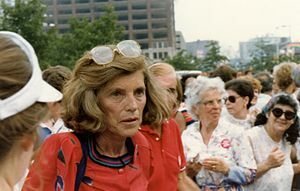 ^ "Eunice Kennedy Shriver – Doctor of Public Service" The Shriver Center, The University of Maryland, Baltimore County. Accessed May 28, 2008. ^ "Eunice Kennedy Shriver". Special Olympics. archive.org. Archived from the original on 2008-01-28. Retrieved August 12, 2009. ^ a b Staff writer (August 11, 2009). "2002 Teddy winner Shriver dies at 88"[permanent dead link]. NCAA News (at the National Collegiate Athletic Association). Retrieved August 15, 2009. ^ "Rose Fitzgerald Kennedy - John F. Kennedy Presidential Library & Museum". www.jfklibrary.org. ^ "Eunice Kennedy Shriver's legacy lives on with Special Olympics". ^ "Special Olympics Founder Honored at The 2017 ESPYS". Retrieved July 13, 2017. ^ "Taylor Swift -- "You Belong with Me" (2009)". 2or3lines.blogspot.de. ^ Smith, J.Y. (August 12, 2009). "Eunice Kennedy Shriver, Special Olympics Founder, Dies at 88". washingtonpost.com. Retrieved 2010-03-02. ^ a b Staff writer. "Ted Kennedy Dies of Brain Cancer at Age 77 — 'Liberal Lion' of the Senate Led Storied Political Family After Deaths of President John F. Kennedy, Sen. Robert F. Kennedy". ABC News. Retrieved August 26, 2009. ^ Dallek, Robert (2003). An Unfinished Life: John F. Kennedy, 1917–1963. London: Penguin Books. pp. 105, 731. ISBN 978-0-14-101535-4. ^ "Eunice Kennedy Shriver Hospitalized". washingtonpost.com. Associated Press. November 25, 2007. Retrieved 2009-08-12. ^ Beggy, Carol and Mark Shanahan, "She's loyal to father's 'Ideal'", The Boston Globe, January 14, 2008. Retrieved August 11, 2009. ^ McGreevy, Patrick. "Schwarzenegger, Maria Shriver at Eunice Shriver's bedside", Los Angeles Times. August 7, 2009. Retrieved August 7, 2009. ^ Staff writer (August 11, 2009). "Eunice Kennedy Shriver's relatives called to hospital". CNN.com. Retrieved August 11, 2009. ^ Allen, Mike (August 11, 2009). "Eunice Kennedy Shriver dies". Politico.Com. Retrieved August 11, 2009. ^ "Statement from The Shriver Family". Eunice Kennedy Shriver's website. 2009-08-11. Retrieved 2009-08-11. ^ Farr, Michael (August 11, 2010). "One year ago: Eunice Kennedy Shriver". Los Angeles Times. ^ "Pope's Letter to Kennedy-Shriver Family". Archived from the original on 2011-06-08. Retrieved 2009-08-20. ^ a b McMullen, Troy (August 26, 2009). "The Last Kennedy — Death of Ted Kennedy Leaves One Surviving Child of Joseph and Rose Kennedy". ABC News. Retrieved August 26, 2009. Eileen McNamara (2018). Eunice: The Kennedy Who Changed the World. Simon & Schuster. ISBN 978-1451642261. Shriver, Maria (August 14, 2009). Transcript. "Maria Shriver's Eulogy of Her Mother", The Boston Globe. Accessed August 31, 2009.